Spinoza and Stiegler are both transindividual thinkers. In the first case this is avant la lettre, Spinoza innovative conceptualization of desire, affects, and individuation preceded Simondon’s particular conceptual neologism. In contrast to this, Stiegler announces his debt to Simondon’s concept on practically every page, transindividuality remains a central conceptual point of theoretical reference, remaining constant in the readings of Husserl, Heidegger, Freud, and Leroi-Gourhan. To argue that they are transindividual thinkers does not mean that they somehow dispense with the individual, displacing it into nature or history, but that individualization must be thought from the relations that exceed it and make it possible. In fact, Stiegler and Spinoza both combine an ontology of relations with what could be considered a strong emphasis on the irreducible singularity of existence. This is well known in the case of Spinoza's conatus, in which everything is defined by its particular striving, but I want to approach it from a different angle, from their different theories of signification. I was driven to this unlikely connection by reading Lorenzo Vinciguerra's Spinoza et le signe: La genèse de l'imagination and the two volumes of Stiegler's De la misère symbolique (L'époque hyperindustrielle and La catastrophe de sensible). In order to develop this connection I need to sketch out Spinoza and Stiegler's respect theories of interpretation/individuation as it relates to what could be broadly called interpretation. Stiegler's theory is developed, as is often the case, from an eclectic synthesis of Husserl on time, Simondon on individuation, and Derrida on writing. It starts from a rather basic premise, if what I perceive is in part based on what I remember, my perceptions will be radically singular. "I only think differently from others, I only feel differently from others, I only desire differently from others, I only see differently from others—in short, I only exist—because the retentional process in which I consist is unique, and because this retentional process is also a protentional process, that is, it is a process that constitutes horizons of expectations." What changes this, and threatens this, are what Stiegler calls tertiary retentions, distinct from primary and secondary retentions. The first retentions are those that are fundamental to experience, the extension of the moment that makes any sensibility possibile, the second are the memories proper. The first is the memory that makes a song or a melody possible, while the second is the memory of a song. Tertiary retentions are memories that are inherited rather than experienced, things read, listened to, or watched. In this case a recorded song. Retentions shape and condition protentions, our expectations and experiences. To continue the music example, think of a familiar album (or playlist) and how you begin to hear the new song as soon as the last one ends. Tertiary retentions, words written and gestures recorded, define both collectivity and individuality. They in some sense define humanity, since it is this adopted memory that defines culture. The history of tertiary retentions makes up the history of grammatization. For Stiegler this history is marked by one significant shift, the shift from writing, including music, and temporal objects. When I listen to a song or watch a movie, its time becomes mine. This is fundamentally different than reading a book or music, in reading there is always a gap between my time and the time of the text. Temporal objects synchronize our time with theirs. Stiegler's idea here is similar to the passage quoted in Benjamin's essay on the work of art, where Benjamin writes, 'I can no longer think what I want to think. My thoughts have been replaced by moving images." However, Stiegler's actual thought is closer to Adorno and Horkheimer. Stiegler argues that the temporal objects of the culture industry lead to a loss of individuation. We think the same things, watch the same things, and experience the same things. It is important to note that this loss of individuation is not a loss into some "they," crowd, or mass. It is a loss of both the singularity of an "I" and the collectivity of a "we." The marketing of tertiary retentions destroys both the basis for individuation and collectivity. These difference of interpretation are not based on primary and secondary retentions, but on the singular character of the body. The body is singular plural, a singular striving determined by the history of its multiple affections. Despite the massive philosophical gulf that separates Spinoza from Stiegler, a gulf expressed in terms of the former's physics of bodies and the latter's phenomenology of time the fundamental point in terms of a general semiotics is the same: signs, which is to say experiences, are interpreted based on past history. Traces or retentions determine the interpretation of future traces. As Vincuiguerra writes, "Les conatus imaginatif est un conatus interprétatif." It is also possible to argue that Spinoza also critiques a politics of disindividuation. 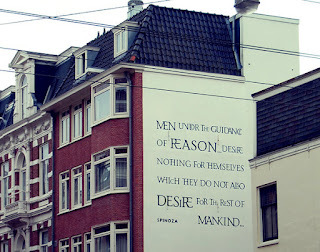 Spinoza argues that despots, those who rule by superstition, try to impose a dogma to invest religion, true or false, with such pomp and ceremony that it can sustain any shock and constantly evoke the deepest reverence of all its worshippers." Superstition is an attempt to create the same memory, the same imagination, making all the same signs mean the same thing. However, Spinoza argues that such a goal is fundamentally impossible, the singularity of the conatus resists such standardization. Stiegler would perhaps argue that this impossibility is historical, that film, television, and the internet make possible a synchronization of thought and consciousness that despots of Spinoza's time could only dream of. There is of course something to be said about this, and Stiegler is at his best when he is arguing (again and again) that the entire set of philosophical questions regarding the politics of knowledge need to be situated against the history of the various technologies of its dissemination, from writing to the internet. However, in this case I prefer to think of this difference as more philosophical than historical; after all, Spinoza's political philosophy is in part founded on a irreducible element of singularity, the inalienable power that is retained in each body. It is this power that contradicts any social contract, any transfer of power, and it is this power that exceeds any attempt to produce a common imagination. "And from this we clearly understand why the mind, from the thought of one thing, immediately passes to the thought of another, which has no likeness to the first; as, for example, form the thought of the word ponum [apple] a Roman will immediately pass to the thought of the fruit, which as no similarity to that articulate sound and nothing in common with it except that the body of the same man has often been affected by these two, that is that the man often heard the word ponum while he saw the fruit." "Sometimes a man undergoes such changes that I should hardly have said he was the same man. I have heard stories, for example, of a spanish poet who suffered an illness; though he recovered, he was left so oblivious to his past life that he did not believe the tales and tragedies he had written were his own. He could surely have been take for a grown-up infant if he had also forgotten his native language." There is much to be said about this passage, and Warren Montag has said a lot of it, but for our purposes here it is worth pointing out that there are two memories, two individuations. There is the memory of works written, of experiences, and of language itself. One is lost and the other is retained. The first relates to the affects, imagination, and body, to the idiosyncratic basis of this body, the other relates to language, and perhaps even the common notions, to a collective history...at this point we exceed a blog post. Here is the source of my title. Get it? Spanish (poet) plus (Stiegler) technology equals Spanish techno. It is not that funny, but it is a decent song (and it turns out to be about the destruction and creation of individuation). This is extremely interesting, and it makes me want to read Stiegler. I believe I take this to mean that the difference between a primary retention and a tertiary retention is the difference between being a lumberjack and listening to a song about being a lumberjack. Is that about right? Joel, Yes, basically. Primary retentions are the memories necessary for any experience. The memory of the beginning of this sentence that makes it possible to make sense of it. Secondary retentions are the memories of experiences. Tertiary retentions are memories without experiences. The different retentions act on and affect each other. Cops on _Cops_ imitate cop shows. Terence, Thank you very much for the links. I've read this a bunch of times. Stiegler's distinction between temporal and non-temporal objects of memory/tertiary retention make me think that some methods for social control that existed before the information age relied gained their power to subjectivize from their temporal qualities: political ceremony, religious ceremony, public execution, stadium sports and plays (like that puppet show about DeWitt at the beginning of that made-for-TV movie about Spinoza). By the way, at the end of your 6th paragraph you mention primary retentions - is that a typo or am I just not understanding it right, because I feel like you were talking about tertiary retentions. I think primary retentions are present perceptions, and are too individual and singular to be effective as marketing - whatever instantaneous hallucination at the glimpse of an ad can't be anything but subversive to its intentions ("Hey, that guy on the Country Crock commercial is Stu from Rugrats *fart noise* [everyone laughs]"). I also realize, as I re-read this, that the singularity of perception can be thought of as what makes collectivity possible; the audience at the House of Orange puppet show are neither individual nor collected, although their transfixed gaze towards the scene is enough for one to mistake them as a psuedo-collective (which contrasts with Spinoza's circle of friends and disciples). Anyway, I've often wondered if mass media is causing us all to become more and more realist, especially as we bore deeper into the temporal imagery of the internet age. Memes, GIFs, and other forms of tertiary retention are exploding in popularity, and outmoded social concepts like the contract and law become more and more plausible, but in this twisted way: we consider our individuality as attempts to break free from stereotypes, not as hopelessly singular beings who strive toward normality. Thanks for the correction. Yes, that was a typo which I fixed. Yes, control of tertiary retentions has always been a goal of politics. To some extent it is what Spinoza understood as superstition. It does interest me how social media changes the terrain of individuation. If twitter does not destroy the fiction of the individual, I do not know what will.